A female Cooper's hawk. Photograph by Ken Smith. I hadn’t even left Shayne’s house, before I got a call about another hawk. Jim and Maureen’s neighbor had found it in their back pasture, unable to stand. After many phone calls (recall this is New Years Day), they were referred to Owl Moon Raptor Center, and I met them there when I arrived. 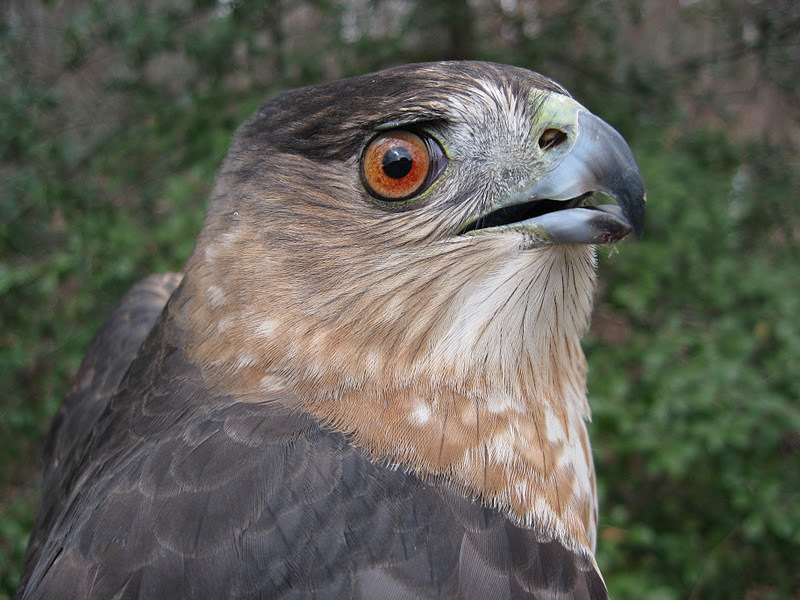 It turned out to be another Cooper’s hawk, an adult female, a beautiful bird I called “Grace.” I will warn you from the start that Grace’s story ends sadly, though I was not without hope when I first examined her. Grace’s condition was perplexing. She could not stand, but she could move her upper legs. Her lower legs were folded at the hock or (ankle) joint, and both her feet were clenched. The joints were rigid and difficult to pry open. My first thoughts were 1) spinal injury, as Cooper’s hawks are particularly prone to impact traumas involving the head or spine because of their aerial pursuit of avian prey, 2) some kind of toxin, or 3) West Nile Virus (WNV). We are past the normal season for this mosquito-borne disease, but it has been a warm fall/winter here, so I didn’t want to rule it out. I have never seen a case of spinal injury with these specific symptoms, but I started Grace on a NSAID, non-steroidal anti-inflammatory drug, which is prescribed for CNS disorders/injuries, as well as in treatment for WNV. That afternoon I brought her to Second Chance, where Dr. Pat Klein examined her and took x-rays. The x-rays showed no visible spinal damage, but this is often the case even when symptoms are clearly spinal, as there can be soft tissue injury, including nerve damage, with no visible displacement of the vertebrae. Pat considered toxicity as well, but spinal trauma was the prime candidate. She recommended I continue NSAID treatments and hope for improvement in the next few days. With the NSAID and supportive care (fluids and hand-feeding 2-3 times daily), Grace grew stronger and more active and alert over the next several days, but her legs remained folded underneath her. I worked on her joints a bit, and they gradually loosened and became more pliable, but she was not very responsive to the touch. My next step was to email avian specialist Dr. Erica Miller at Tri-State Bird Rescue and Research in Newark, DE. She advised me of a test I could do to confirm spinal damage: if I pinch the toes and she pulls back, but does not look at her toes or attempt to bite or do anything else, then it is indeed spinal. If not, she advised that clenched feet are associated with some neuro-toxins, including organophosphates (Ops), carbamates, and organochlorines. Ops and carbamates will slow the heart rate, and there is an antidote for these toxins. With organochlorine poisoning you can only provide supportive care and hope it will work its way out of her system. Unfortunately the test confirmed that Grace had spinal damage. I wanted to give the NSAIDs more time to work, so I continued to treat and support her for a few more days. My hope of a good outcome faded with each new day when I saw her lying down. After a full week I took Grace back to Dr. Pat intending to euthanize, but in a last ditch effort we decided to give her the antidote for Op and carbamate poisoning in hope of a miracle. She did not respond to this treatment either. Thus, after eight days of intensive care, Grace was euthanized.